Today’s report on housing starts for April from the Census Bureau and HUD shows a fall back from the revised March annual pace of 1.0 million units to 853 thousand. Most of the decline is attributable to a correction in the multifamily sector. Single family starts dipped to an annual pace of 610 thousand in April from 623 thousand in March, but multifamily starts plunged from a pace of 398 thousand in March to 243 thousand in April. Multifamily starts traditionally are more volatile than single family and the swings in the last several months are a perfect example. The average pace of multifamily starts has been 321 thousand since December, but that average is based on the pace of starts jumping up 97 thousand units in December from November’s pace before falling back 79 thousand units in January. February and March accelerated the pace by 114 thousand units, so the correction to the pace this month is no surprise. Overall, today’s report is less exciting than it may appear, single family remains on track while multifamily continues to thrill. The pace of single family construction has risen steadily since late 2011 while the pace of multifamily surged in late 2012. We expect single family production to continue to make steady gains over the next two years on its way to a more normal level of production surpassing one million units annually. 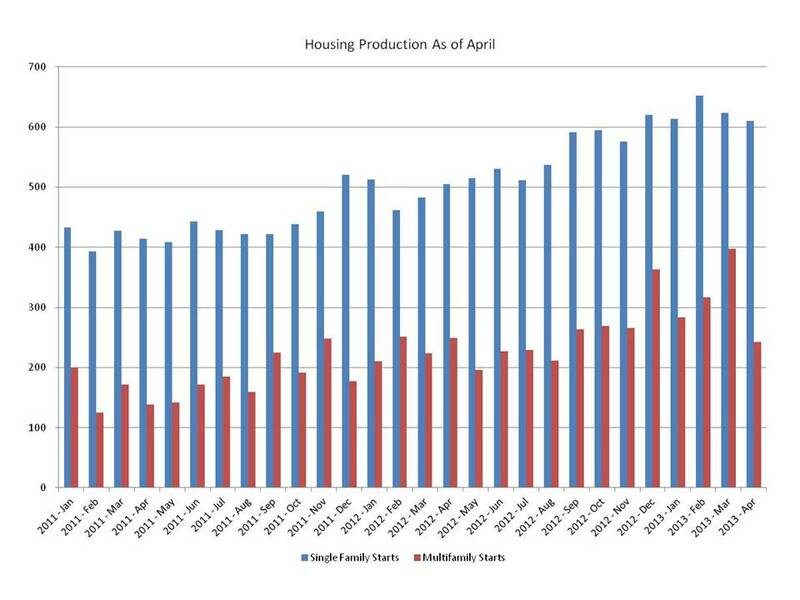 Multifamily housing starts are likely to exhibit continued volatility as it finds its sustainable level of production between 350 thousand and 400 thousand units annually.